Cabaye v Barton: Yohan says he's up for it! | NUFC Blog. Newcastle United midfielder Yohan Cabaye muses on the English game and is looking forward to playing against Joey Barton in our next league game. Things seem a bit flat of late. By which I don’t mean that they’ve been run over by a passing steamroller, but rather since the transfer window closed – and without a game last weekend – there just doesn’t seem to be a lot happening on the ‘Toon News’ front. I’m curious to see how Pardew will attempt to talk around the abject disappointment of the late transfer window dealings. Or lack of them in our case. I actually feel for the guy as I reckon his disappointment will be equal to ours and yet – if history is any guide – he’ll be tasked with trying to put a positive spin on things. He could start by mentioning Yohan Cabaye, who has been speaking to The Journal to tell them he’s all fired up to play opposite Joey Barton in our upcoming game against QPR. Well, hopefully, although I don’t think QPR will be pushovers by any stretch of the imagination. Which is true enough. Amidst the furore of the final 3 weeks of the transfer window, we have managed to grab 6th place in the Premier League, which is not to be sniffed at. I’m well aware that start of the season results aren’t always indicative of things to come – and I tend to think the slog from January onwards is the ‘telling’ time – but we have 7 points from 9 chalked up on the board and that’s a pretty good start. “It was difficult to adjust to English football at first. I have had to adapt but the only way you can get more experience of it is by playing. That is how I will get better. “The Premier League is more physical and faster than French football. In France it’s more tactical – a lot of short passes. Here it’s different. I have often wondered why the Premier League is so different. Teams like Arsenal have in the past tried to play a more European style of football but, overall, we do seem to play faster, more physical football and that trend continues despite the number of foreign players and managers we have in the Premier League. I’ve liked what I’ve seen from Yohan so far, bearing in mind that there’s bound to be a period of Premier League adjustment for both him and the summer’s other foreign recruits. Hopefully he (and we) will come out on top of the battle against Joey a week today. He will run rings around Barton. Only way Joey will be able to compete in the middle against Tiote and Cabaye will be by fouling. Barton joins a crap club for more money after we stood by him during his “dark years”, and now thinks he’s the voice of the Geordie Nation? Nah mate, you’re just another sell out trying to stop us getting 3 points. Cabaye does look class, I wish Joey well, while I wasn’t happy with the way he acted ( I think he was pushing for a transfer) he stuck around after we were relegated and should be remembered for that. The club owed him noohing and he owed the club nothing. hugh, i have just been on the “chronic’s” website,and low and behold,the puppet is back spouting. headline,”let’s get on with it”,completley predictable,you could see this coming from january. 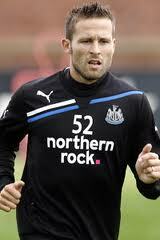 cabaye does look like he’s got some skills,has only showed it in flashes,thus far. that’s to be expected,changing countries,styles of football etc, i’m sure there will be more to come from him. on the subject of spouting,our new gallic addition,does like to hear himself on.it must be a pre-requisite on signing for newcastle,”must spout on a regular basis”. i hope he wont be another propaganda agent for “jabba the warehouse” lol. You don’t get to win your domestic league and cup by being a passenger. His tackling and passing is excellent but what struck me was his willingness to take a shot. I think he is going to score quite a few goals for us. Another Rob Lee perhaps? I think we will only see the best of Cabaye when Marveaux and Ben Arfa are playing alongside him as they have all played together before. “parnocchio’s” headline is,”time to get on with the job”. was it ever going to be any different,i think not. If we’ve got another Rob Lee on our hands I’ll be in dreamland. Leave Pardew alone mate, he’s doing a good job in pretty difficult circumstances. I believe he was lied to just like us, and told we’d get a striker in. But he has to get on with his job and we have to get on supporting the club. Giving in to negativity didn’t do us too well during the relegation season did it? no – I agree with JT@6 – asbo owed us big-time – as far as I know we actually paid him while he was in prison – and all the suspensions he had for brutal play. He was up for sale when we went down and quite rightly no one wanted him. He did well in the championship & last season – but that was his job for which he was hansomly paid, so does he expect a “bonus” like a banker for just doing his job? Then when listed no one was interested until he was a freeby – and QPR did not trample over anyone in the rush! Over his whole career at NUFC he was a poor signing and damaged the image & reputation of our great club. john t, he probably was lied to,but more fool him,for believing them. alan pardew was warned by nearly everyone in football,about what ashley and llambias,were all about. then if you add the accusation,he took a mans job,six weeks before he was sacked,a la cosy little dinners with dracula,then can we really feel sorry for him?. yes it is difficult circumstances,but he knew what the score was,before he sold his a**e to the barrow boys. JB didn’t even hardly play in the championship mate & openly admitted at the end of that season that he’d barely played & the plaudits should go to the rest of the team, which was big of him, i’m sure. If he wasn’t a freebie no one woulda took him off our hands. The team that did is a newbie, so ‘newbie takes freebie’. Cabaye will easily better the one good year JB ‘sold’ us. well, I must admit I (and many others) were less than impressed with Lee at first – few had heared of him & he looked light weight – but it just shows how wrong you can be, and he must be KK’s most insightful signing. Lee had a briliant career with us – but I still think that when we lost that 13 point lead over manure it was a dreadful drop in form from Lee that was a major factor. Everyone gets lied to & lies every single day, it’s man’s humanity(no, not inhumanity, it what we always do) to man. Gotta say: he looks even better than Rob Lee, can’t wait to see the lad when he’s totally settled. Can’t wait to see MA in his next ‘close ups’. @8 He’s doing his job mate. 7 points from 9 isn’t a bad little start to the season, get a win over QPR and we’ve had our best start for years. I know if in my work I kept telling everybody I met in a public forum how much of a nobhead my boss was I wouldn’t last very long. If he gets sick of taking grief from fans and lies from Ashley and jacks the job in I have literally no idea who would take us on. JFK? To be honest, if he keeps this start up to the season I wouldn’t care if he plotted to take my job from me. All this Chris Hughton veneration is wearing thin anyway. Hoofing the ball up the field to the big man may have been efficient, but it sure as hell wasn’t attractive. john t , i’m not having a go at the start to the season,it’s his constant spouting of claptrap. i for one do not feel sorry for him in that respect,he has brought a lot of this on himself. it’s as though karma,has come back to bite him,he swung the pendulum too far,and it’s now come back and skittled him. he went into this with his eyes open,and with accusations of him taking a man’s job,six weeks before he was sacked. i’m as gutted as the next fan,that we haven’t signed a replacement for carroll,but at the same time,pardew has got his just desserts. if pardew did resign,there would be plenty mugs around to take the job,and ashley wouldn’t think twice about employing them. after all they are only required to take charge of training,and put them on the pitch come matchday. paolo di canio,at a push,expect a fight on the touchline with his own players lol. Can’t see AP resigning any time soon like. Can’t see MA selling up any time soon either. So i wouldn’t go getting ya’ hopes up, holding ya’ breath etc. Manager always spout crap, it goes with the territory. CH was an anomaly that just cemented that rule. Trojan, I see what you’re saying but I don’t think it’s his choice to spout the claptrap. There are bad parts to everybodies job, and expecting them to walk away immediately when confronted with them, a la King Kev, is unrealistic. The word is Pardew needed a job pretty f–king badly when we came along, Ashley had him by the balls and knew it. Allegations of accepting Hughtons job before he’d been sacked, as well as those surrounding his “complicated” personal life suggest he isn’t a very nice guy. I don’t care. He’s getting results. And yeah, I do have sympathy for him. He gets humiliated on a regular basis by his boss in front of a gleeful national media and furious local fans, and he (according to rumour) can’t afford to leave the job. Anything that lowers the morale of our boss whilst we’re on a good run is something I don’t want to see happen, and I’m frightened Ashley will push him further than his dignity will allow and he’ll resign regardless of his (alleged) financial worries. They also all lie, spin, u-turn, & generally use every PR trick in the book. Otherwise they are either dumb or too honest for their profession. Either way ya’ get ya’ teeth bust. We’re guilty of over analysis of every little bit of info at the club. It will get us nowhere but picking it all to pieces. No, i’m not saying don’t pick, but there is a limit & that’s when we don’t know when or how to stop. We’ll always find fault & we’ll defo find fault if we continually search for it or spin every move to suit our distain. Soz like, more an observation than a criticism. I don’t care or believe the rumours about Pardew. I think he is doing a good job. I now think he is in a much stronger position because of the board’s failed attempts to get a good striker over the line. He knows that the board has let him down badly and I wouldn’t be surprised if there had been ‘words’ behind closed doors along the lines of ‘back me or sack me’. I therefore think the board will back him in the January transfer window. I’m glad we didn’t waste cash on crouch £10m etc. There were exactly a glut of top strikers moving were there? The ones we were, seemingly, in for were all better than what we have. I woulda risked £6-7m on Long personally. But Cisse looks canny, but more expensive than they wanted to pay. I really would have possibly took a punt on a lower league, up & coming striker. When HBA’s back, & his leg will have had extra time to mend now too, & Vuckic get a shout, we should be in good stead. We have a much quicker, more skillful midfield now. Marveaux, Abeid & Obertan could well have goals in them too. We should be able to employ a much more fluid form now we’ve got more mobility centrally. Carving out more chances rather than pumping hopeful lumps up field. kamar, if they haven’t backed pardew by now,they never will. You might be on to something there mate – eternal optimist that I am I’ll wait and see. I’m not sure if that’s true. We were one striker away from a great window, and have obviously taken his advice onboard about wanting a quicker more skillful midfield. What they (apparently) didn’t listen to him about is the need for a striker. I think the amature approach of this board toward signings is embarrassing the club. Midfielders are (to an extent) ten a penny. A proven goalscorer at a high level WILL cost a lot of money, because goalscorers are always needed. Market forces in play, something Cashley should know all about. Unilaterally deciding strikers in general are overpriced is unlikely to change this, as if we don’t buy ’em somebody else will. Kamar, you could also have written that two or three of the previous managers under Ashley were “in a much stronger position” through a lack of backing, before they were sacked or walked out. Ashley and Llambias don’t necessarily want managers to be in a strong position at Newcastle United, like Kevin Keegan or even Chris Hughton. i’ve just tried to submit a blog, though it doesn’t seem to work as it did, or something is a bit skwiffy. I ‘quick’ posted it instead & ‘submitted it’, hope that worked. Have you changed something or am i just too dumb to laugh at? Hmmm, you as well Clint? An inquiry will be launched. I dont know if Cabaye will own Barton but if he can frustrate him I can see a sending off in Bartons future. pardew should use his head,he could be in a strong position,the last thing the “gruesome twosome” need is another disgruntled employee walking out. he should use that to try and wield some influence,instead of being a propaganda officer. I think circumstances were different this time. Carr and Pardew had clearly submitted a list of strikers which Llambias and Ashley appeared to agree with because they then began negotiations with the respective clubs. We know this because these clubs and the players agents verified this. The problem(s) appears to be the negotiations which were clearly the responsibility of Llambias, Ashley and perhaps Charnley. The board having agreed to get one or more strikers, which Carr and Pardew were confident of, have now undermined their manager and chief scout, and possibly sidetracked their own five year plan. Worky…I should have said ‘try’ to do to him what others tried to do to him. Is it just me or does anyone else spot serious flaws in certain fans psychological DNA ? Where would we be right now if we hadnt had those players working miracles in an understrength and undersized squad ? JB did great last season. witters, you tried to accuse me of inciting hatred against ashley and llambias,are you not doing the same,in the case of joey barton? andymac,they definatley have short memories,when players leave. Kamar, as i pointed out in my piece about Papiss Cisse, and possibly Llambias (can’t remember), in some cases the club were bidding almost as low as half what the player’s true value was. I’ve just got back from a long holiday in deepest Devon and have been trying to keep up with events. My impression (and I’m sure it has all been said already) is that pseudo-bids were made for players to give an appearance of trying to sign above average players. Any that were accepted were scuppered by ludicrous wage offers that no self respecting quality player would accept unless they were young or were already on not so good wages. We have had a good start (for once) to our EPL season and some credit must go to AP, the team do appear to be pulling for him. It begs the question, is the dispensing of certain players actually a shrewd move, we shall see!! Couple of points I want to enquire about:- Firstly, and I know this has been asked several times, is Kadar still with us? Secondly, is the squad details on the blog up to date, if so I see Aaron Spear is still listed. Also what about Zambelera, if he is any good why don’t we give him a chance. I could probably mention a few others, it is a little perplexing. Trojan…I’m not sure how trying to exploit Barton’s weakness is inciting hatred. Its a tactical thing. He’s no longer our player so why not? Andymac…I’ve never thought Barton was a god. I have huge respect for him as hes successfully battling alcoholism. Unfortunately tho he’s not the sort of individual any football supporter should think is a god/hero. He’s had one okay season in 4 but in terms of appearances he’s compatible with Owen. He was in jail for a lot of season we were relegated so was a massive help when we really needed him, played very few games in the championship & as I’ve said he was okay last season. He’s adored by many cos he was & still is willing to criticise Ashley & llambias & for me all that does is undermine the club. It shows a lack of integrity & if he cared about the club/fans as much as he said he did he’d shut his scouse mouth & concentrate on QPR. My views on barton past/present remain consistent yet just cos I have a different view I’m accused of being part of some propaganda machine. grow up. Hard to argue against that. He did well when he played, but sadly, he didn’t actually play enough. Witters, he was “adored” by many fans before his Twitter campaign, that’s why he was the fan’s choice as player of the season, which came just before the Ashbashing tweets started. Worky…point taken & I do think he’ll be a miss from a football perspective however that’s based on last season & 2 games this season alone. All things considered tho I do not feel his time at Newcastle was a success. Witters, it isn’t the first time Newcastle have had a player who was problematic for years, then sell him just after he came good, or buy a great player just as he turned bad. It’s a Toon speciality that goes back before Ashley.